The coffeehouse was founded in 1990 by a group from the First Universalist Society in Franklin. Our first eleven years were spent at the Masonic Hall, known far and wide for the bowling alley in the basement. Our concerts are presented once or twice a month, usually on Saturday nights from September to May. In September 2001 the coffeehouse moved to the First Universalist Society meetinghouse, 262 Chestnut St, Franklin. Doors open at 7:30 PM and all concerts start at 8:00 PM unless otherwise noted. All concerts are non-smoking and alcohol free. 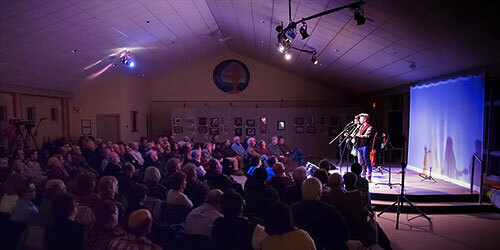 Our audiences come to hear excellent performers in an intimate atmosphere with an exceptional sound and lighting system. 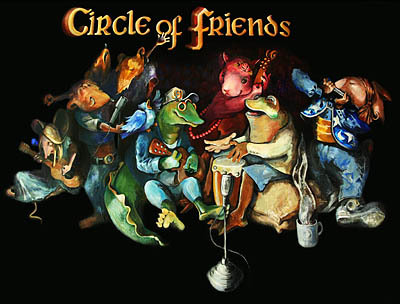 The Circle of Friends Coffeehouse has evolved into one of the finest listening rooms in the country. 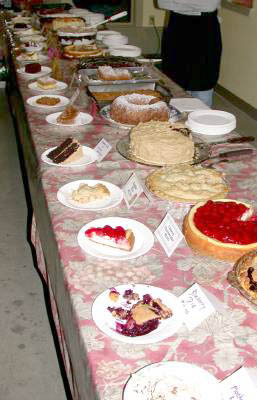 In addition to the excellent music, Circle of Friends is known for its gourmet desserts which vary from concert to concert, but typically include several varieties of cheesecake, carrot cake, fruit pies, trifles, tortes, and mousses. You get the idea; don't have dessert before you come! Coffees, teas, soft drinks, water, and cider are also usually available.